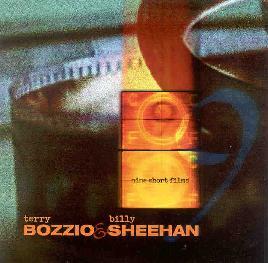 Terry Bozzio & Billy Sheehan - "Nine Short Films"
Well, these two musicians need no introduction. How did these two come together to record a CD for Magna Carta? It is not explained in the biography either. You might expect this to be mostly instrumental but in fact, Bozzio sings on 8 of the 10 tracks. Ok, not really sings, it is all more like spoken words like Tom Waits or Hans Möll from the Moor. The majority of the music is not real classic rock music but drifting songs telling stories. The drumming is quite intense and frantic at times. Bozzio handles the drums, vocals, keyboards and various guitar like synth solos while Sheehan plays all the basses, baritone guitars and lead guitar on "Edge Of A Circle". The title of the CD is quite appropriate as the CD is kind of a journey through what could be several short films. It would have been great if they had made short video clips to go along with the potent lyrics of Terry. "Water And Blood" is a dark song with some Crimson like textures and guitars at time. Many of the songs rely strictly on bass, drums and some keyboards with guitar not playing that important a role in the songs. They sort of roll along on the bass lines and drums. Quite a lot of thought went into putting this CD together with all the moods and strange percussion sounds and the way the lyrics are presented. The final cut, "Sub Continent" is perhaps my favorite song with all the ethnic drums and really cool bass playing. A very interesting CD. You have never heard anything like this, that you can be sure of!